Guyana, a small nation on the northern coast of South America, is home to some of the most attractive snakes in the world. It is right on the northern edge of the Amazon rain forest, where many snake species exist. Among these are the bright green emerald tree boa, the prismatic and enchanting rainbow boa, the slender, striped salipenter, the ill-tempered amazon tree boa, and the intimidatingly large anaconda. The emerald tree boa is a large constrictor with a bulky head. As his name suggests, the snake has a bright, emerald green coloring that helps him blend into the lush greens of the Guyana rain forests. Along the back, he has a white or gray pattern of lines or triangles, framed in black or very dark green, that alternate sides of the spine. The snake is usually about 4 to 6 feet long but can attain lengths of up to 10 feet. The body can be more than 2 inches thick, making the emerald tree boa the thickest, proportionally, of the Corallus genus. The emerald tree boa's prehensile tail is strong enough to anchor him to the trees in which he spends all of his time. There are several named subspecies of rainbow boa. The one most commonly found in Guyana is the Brazilian rainbow boa. This snake averages about 4 to 6 feet in length and has a light brown or reddish coloration with black rings along his back. He has a medium build and soft skin, and can be found on the ground in humid forests or, occasionally, in open savannah. The rainbow boa's most distinguishing feature is his iridescent, microscopic scale ridges that refract light like a prism. When the snake moves, this prismatic light effect results in the appearance of stunning rainbowlike color displays along his skin. The rainbow boa is widely considered one of the most beautiful snakes in the world. The salipenter snake, also called the yellow rat snake, chicken snake, or tiger rat snake, is a very slender snake. An adult salipenter snake averages around 7 to 9 feet in length, with a black or yellow body, and a small round head. If the snake is colored black, he will feature yellow, striped markings; if he is yellow, he will have dark blue or black stripes, which give the snake the tiger nickname. The salipenter snake is comfortable both up in the trees and on the ground but is rarely found far from water, where it forages for birds, frogs, lizards, small mammals and other snakes. Though attractive, this snake is not popular with Guyanese farmers, as the salipenter finds domestic chickens easy prey. Amazon tree boas come in a variety of colors, from dull grays to bright, vibrant oranges, reds and yellows. They are almost solid in color and can reach about 7 feet in length, though most are between 4.5 and 6.5. They spend virtually their whole lives in the trees, eating birds, bats and other small mammals. They are known among collectors to have nasty tempers and will bite at the slightest provocation. In addition to being home to some of the most attractive snakes in the world, Guyana is also home to the largest, the green anaconda. The green anaconda is dark green with black spots, but you won't need to know his markings to know an anaconda when you see one. This monstrous snake can reach 30 feet in length and weigh as much as 550 pounds, over a quarter of a ton! Though there is no record of an anaconda ever killing a human being, their size, alone, is enough to frighten most people. 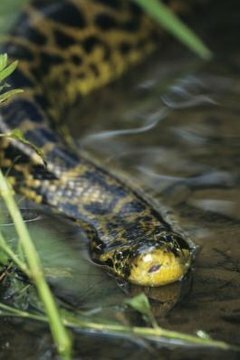 The green anaconda can go for months without a meal, but when it eats, it goes for large fish, small crocodilians or even jaguars and small deer. The green anaconda is capable of hunting on land but prefers to remain in the water, where his dense, muscular body is easier to maneuver.